This was my Christmas decoration this year. Well, there is good news and bad news about my Christmas decorations this year. The good news is that I truly out did myself this year with my Christmas decorations. The bad news is that I had to take him down after 2 days. I had more people come screaming up to my house than ever, great stories. But two things made me take it down. First, the cops advised me that it would cause traffic accidents as they almost wrecked when they drove by. Second, a 55 year old lady grabbed the 75 pound ladder and almost killed herself putting it against my house and didn't realize it was fake until she climbed to the top (she was not happy). By the way, she was one of many people who attempted to do that. My yard couldn't take it either. I have more than a few tire tracks where people literally drove up my yard. Kind of feel like I gave in to the man by taking him down but my neighbor did confirm to near miss accidents on the busy street next to my house. I think I made him too real this time. Well it was fun while it lasted. Oh my! When I first started editing this photo, I thought it was real too! Very funny, but I can see why it might cause some traffic accidents. At least you got a good photo. I thought this was hilarious! I could totally see why you had to take it down though. Good for a laugh, but not so funny if you were to get sued. I showed it to everyone in my family and they loved it too! Perhaps if you had made him into a Santa, people would realize right away that it is decoration. Hmmm... Thanks for a much-needed giggle! OMG that's so cute. I agree it could cause a wreck. That's pretty funny . . . I like your sense of humor! Too bad you had to take it down, but at least it was fun while it lasted (and you got a pic to share!). Thanks for sharing! Maybe if you made that guy hanging on Santa Claus it might not have caused such a stir lol They would actually get it! 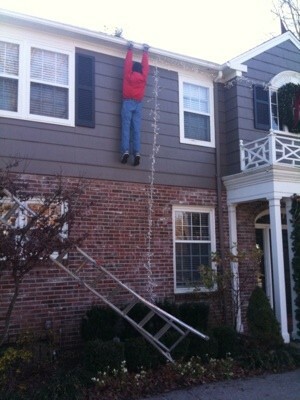 lol Ya, I think by the way the guy is hanging no feet swinging or no yelling people would get it sheesh! Too Much....next time, put up a sign that says, its a decoration, do you need instructions. :) I loved it. I have been laughing about this for days! The first laugh (chuckle) is for when you think it is real. The 2nd (guffaw) when you find out it was a decoration; and the 3rd (rolling) when you started thinking this might cause a ruckus and you read down a little more and found out it really did. It is great that so many people tried to help, and that people still do care about each other. That is funny! Much better than the usual decorations you see at every other house. Looks real also! Happy Holidays to you! Hmm. I would comment on this but I have received this same picture, with the same wording accompanying it three times in the last three days now, all from different parts of the USA, all claiming it is their photo! So you can see I'm a bit sceptical! Sorry! Hi Bujubaby :-) Hey, this was submitted under the category of 'joke' and if you notice I stated the source was my neighbor Jordan ;-) The joke is meant for fun and if I wasn't disabled and living on the first floor in an apartment complex and had a second story home of my own I wouldn't hesitate for a minute in doing this and I am sure many others would agree they are envious to not be able to do this too. I applaud whomever actually originated this and shared it with such a funny story because it has given so many people so many giggles and we all need giggles every day to remain sane in this world. Oh My! He does look real. Oh my gosh, Kerry! Glad to meet you and you should be quite happy and pleased that you've given so many laughs to so many people! What a hoot! What are the chances of the person who actually originated this would end up here at ThriftyFun! I thought this was hilarious but I probably would have freaked out also driving by and seeing that, lol. Thanks for your email. This has been so fun watching it go around on email and on blogs. I have gotten this from a bunch of people who did not realize it was mine. I will send additional pics later today. I sent the original email out on my blackberry and have no idea how to get the other pics on my computer ( not much of a computer wiz) but will figure it out tonight. I literally sent that email to about 10 people and now it is everywhere. My goal was certainly to keep it up longer and I still have people driving by my house and, if I am outside, they will ask me why I took it down or when I am putting it back up. I still have the guy hanging in my garage and he still scares the crap out of me when I walk in there and forget he is there. I am hoping to put him back up this weekend and taking video of people running up to the house because I do not do it justice. Most people have been very good about it. Even those who came running and I mean sprinting, up to my house laugh when they saw it. I did have someone come up and smash the pumpkins we had out and a few otheres who decided to run over to my neighbors to yell at them since I was not home. I live in Kansas city and there is snow on the ground which is good since I have huge tire marks in them from some lady who was backing up her SUV to have the guy jump on top of her car. After I took it down, I was outside and a lady brought her little daughter over and I had to explain to her that the man was not real since the girl had been asking about him and was very worried which is cute. The lady who started crying actually called the cops as she was walking away but I told her not to bother since they had already been over twice. The best one I think was an off duty firefighter who totally freaked out. He was screaming at the guy and I just sat there and watched cause it was hilarious. He grabbed the ladder and climbed all the way up and started grabbing the guys foot. right as I came out and told him it was fake, every person in his car started laughing hysterically. I wasn't sure how he was going to react but once his heart started beating again, he laughed and shook my had and told me that at the station they always play pranks on each other and he is known as the guy who never get gotten but that one, obviously got him. all and all it was well worth the effort because it did take a lot of time to make the guy look real. now it is kind of a bummer looking up at my house and seeing ordinary Christmas lights. My wife was glad it came down because she stopped answering the door. She told me that when people come up to the door, they rarely are there to tell her it is awesome. She is about to have our 4th baby so I pity the person who did yell at her. I would not want to mess with her right now :) The only thing I did to help me compensate for my "lose" was to buy a leg lamp like the one from a chirstmas story and put it in our front window. I haven't put it up yet. I am waiting for the baby to be born and then I am going to put it up before she comes home. Should be an interesting conversation with her when I bring her home from the hospital with our new baby. It sometimes is very interesting to be married to me. But she is a good sport. I live in Richland, Washington ... Where do you live ??? Oh the whole thing made me laugh so hard. I woke my sleeping doggie. Too funny! Ever since I saw a decoration like this on the internet I have been doing the same thing. This year I think the best part was when a group of police assigned to directing traffic for a Christmas Parade saw me setting it up. Well, what they saw was me walking out of my apartment with what looked like a dead body slung over my shoulder! Could not have choreographed it better, at the same time all of their jaws dropped and a 3 count later they started cracking up. Haven't had any negative reactions, lots of people taking pictures. Love it.